Printing out a list of the contents of your folders is useful to know what you have in them exactly. While it's fairly easy to print out a list of folders, it's harder to include all subfolders, invisible files and other items. PrintFinder makes it very easy to select all the items you wish to show in your list and even filter files according to keywords. Your list will be generated in the main part of the interface, showing you how it will appear when printed. Once your list is created, you have multiple output options. Not only can you save it in TXT, RTF, RDF, Word or Html, you can also immediately print it out. We suggest making a copy of it before printing though, in case you might need it again. 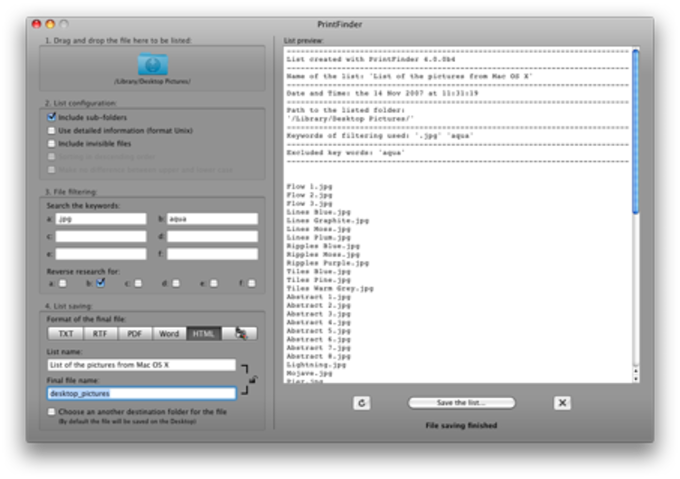 PrintFinder has a clear cut interface, which allows you to create a list in seconds. The application is also available in French and German. 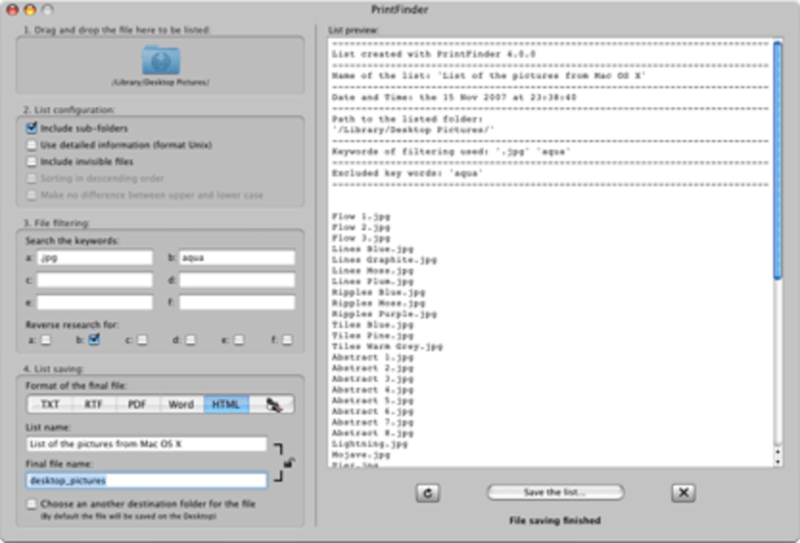 PrintFinder allows you to create and print indepth lists of the contents of your folders. With Mac OS X, to be able to print the list of files contained in a folder, simply drop this folder on the printer icon. But if you want to include in the list the contents of subfolders or ignore invisible files or get information about the files or filter the files using keywords, this feature quickly becomes limited. It is possible to have all this via Unix commands in the Mac OS X Terminal, but still need to know the commands to get there. "PrintFinder" provides a graphical interface that allows you with a few clicks to be able to create and customize your list of files. "PrintFinder" will generate a list containing both a heading (list name, date and time, path to the listed folder, etc...) and a list of your files. With the real-time preview, you can set your list according to your needs (including subfolders, view invisible files, view detailed information, filtering files by keyword, etc...). When your list is ready, you can either choose to export to a file TXT, RTF, PDF, Word or HTML for digital archiving (CD - DVD - FTP - web), or to print directly to your printer for paper archiving. What do you think about PrintFinder? Do you recommend it? Why?